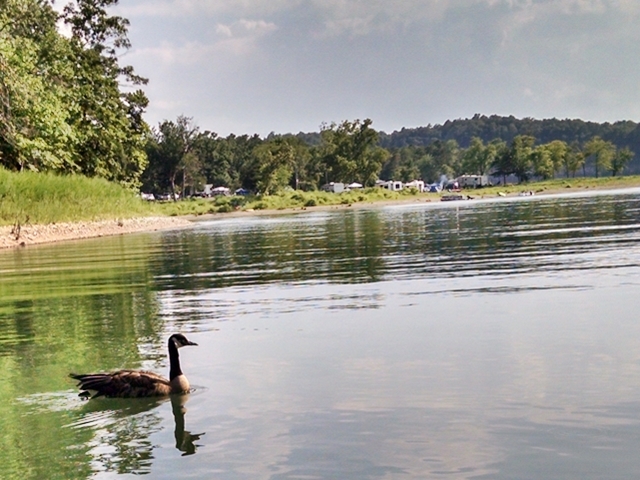 Our cove offers a safe and relaxing area to use Beaver Lake. The Cove At Horseshoe Bend On Beaver Lake Near Rogers, Arkansas Here’s a little peek at the cove here by our property. 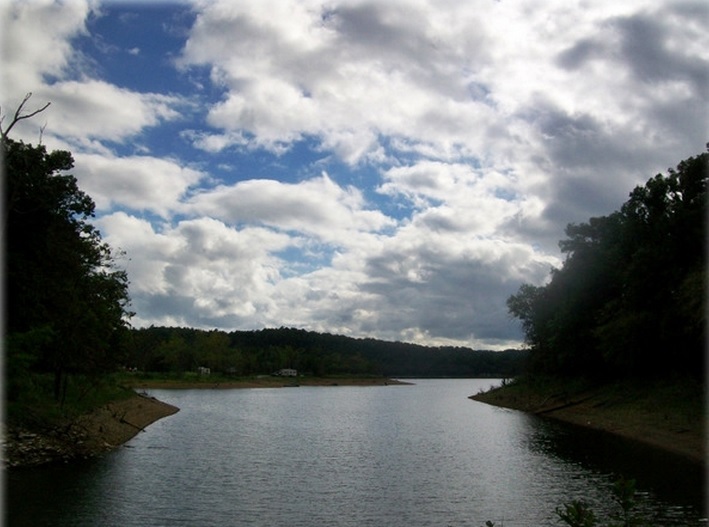 Beaver Lake is a Corp of Engineers Lake. What that means is that they own all the shoreline on the lake. They control every aspect of this puffer strip. Any one may use it anywhere, BUT you cannot cross private property to get to the shoreline. They want the beaches to remain as natural as possible. We pick up trash and probably more than we are supposed to … it’s hard to know what that is. I’m trying to smile here … ! Their take line is on my land, there is a country lane across this. Our path goes down to the cove here. It is a pleasant walk through the trees. You can see the crowds across the cove in Horseshoe Bend Park, but they don’t come into our cove. This makes the water calm, our boats and water toys protected, and playing in the water much safer. Amazing color shown between weather, sky and water! Come on… I’d really like to show you the cove. I think we do a pretty good job of keeping it clean of trash, and still letting it be natural. Look for the “Big Bobber” in the tree on your left… these are the steps off the Country Lane. They are earth and pinned logs to stay with the natural look and to keep them some what hidden. They walk very easily as does the “S” path. Walk down and to the left. Stay toward the big trees and logs on the sides of the path. It’s just a little way… your at the beach now. The huge logs on the beach are great places to sit… there are chairs under the shade trees, too. You can take these chairs into the water if you would like. These are great places to watch the kids (or the wildlife), watch the water and the clouds … fish a little, or read a book. You’ll love hanging out on the FlotoBoat! The Float Boat serves as our dock… 36 feet of open carpeted floor with lawn furniture, BBQ grill and it’s covered to. You’ll love hanging out on the FlotoBoat! 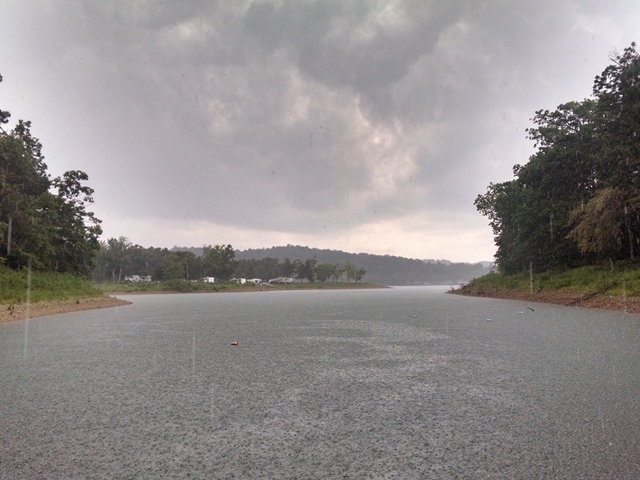 It’s relaxing to sit here and watch the rain come in across the lake. 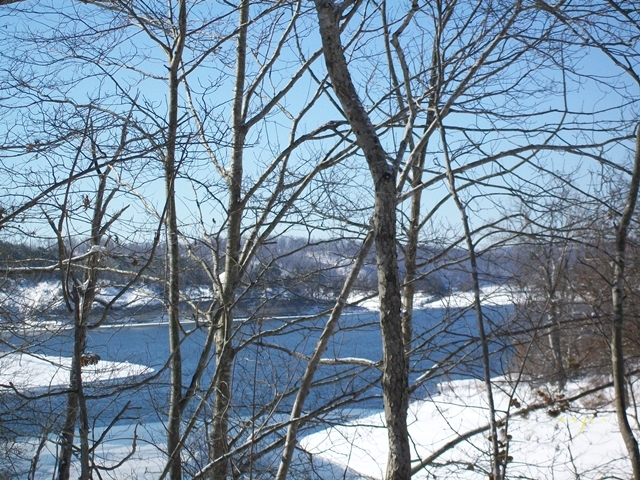 Winter is a wonderland at Beaver Lake. Long walks in the snow are when you see the unusual around the lake .